Well, the biggest sale of the year is finally coming to an end. Are you cheering? Or is that your wallet clapping?! HA! I’ve got to say, the sale ROCKED this year. Yes, everything sold out multiple times, then restocked again, but that’s the beauty and fun of the whole thing! Being able to get your hands on upcoming fall trends and fashion for a discount is SO much fun. Lots of items are still sold out, but surprisingly some of my favorite finds are still in stock. 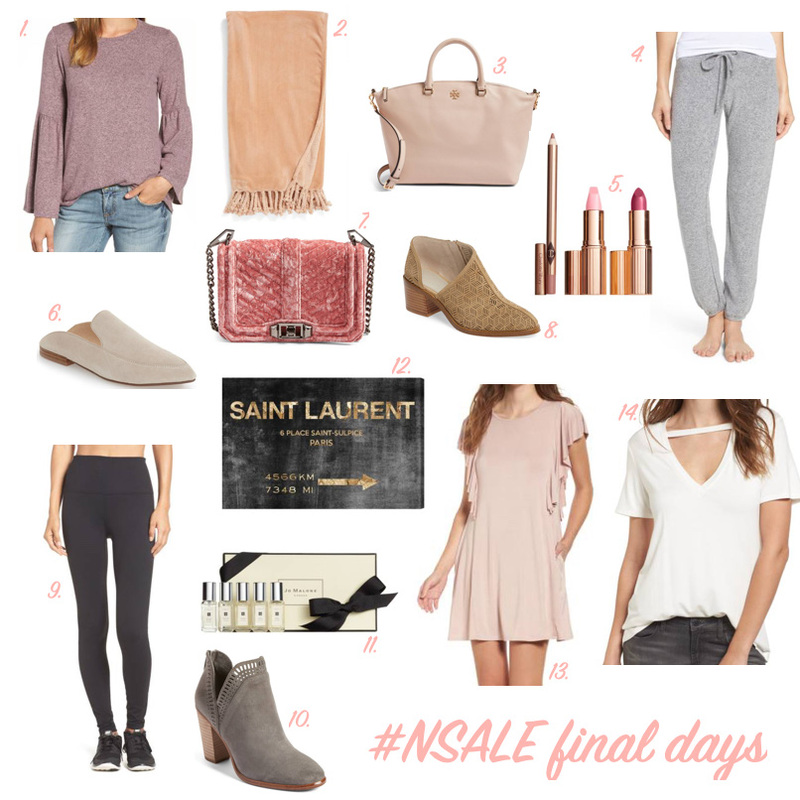 The Nordstrom Anniversary Sale ends this Sunday August 6th so if there is something that is still on your list, get shopping! 1.) Bell Sleeve Cozy Fleece Pullover – Hello cute and comfortable sweater! I love love love this top and just added another color to my cart. It’s so soft and runs true to size (I got a small). 2.) “Bliss” Plush Blanket – $25 for a super soft and pretty throw?! Yes please! I got this decorative blanket in both the blush and white; one for our bed and one for our couch. 3.) Tory Burch Satchel – Ok, this was a splurge for me this year and I’m SO glad I did it. I ordered this bag in the black because I was in need of a classic black bag. Such a gorgeous satchel that will last me for years to come. 4.) Good Vibes Jogger Pants – I can’t say enough good things about these jogger pants. I actually couldn’t believe the sale price when I got these because they are SO comfortable and well made. I will be living in these this fall. 5.) Hot Lips Lipstick Set – I love all Charlotte Tilbury lipsticks so this purchase was a no brainer for me. 6.) Capri Mule – Mules are in. So these babies were a must for me. I originally sized up 1/2 size to a size 7 but they were too big. I reordered my true size and they fit perfectly. 7.) 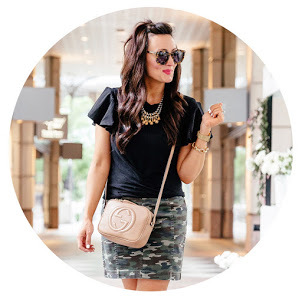 Small Velvet Crossbody Bag – First off, I love Rebecca Minkoff. Second, velvet is trending for fall. To be honest, I bought this bag on a whim and thought I would probably return it. Boy was I wrong. This bag is SO cute. I love everything about the pink velvet and have been wearing it on repeat. 8.) Perforated Cutaway Bootie – LOVE! These are one of my top three shoe purchases from the sale. I got my regular size 6.5 in the color fog and I’m so happy with them. 9.) Zella Leggings – DUH! These were a must for me as every year I restock and buy 1-2 pairs of these leggings. They are so so comfortable and I love them even more than my Lululemons. (I wear a size small in these). 10.) Vince Camuto Shaft Bootie – I was dying for a cute pair of grey booties for fall and these checked every box on my list. I got my regular size and they fit perfectly. 11.) Jo Malone Perfume Collection – I love Jo Malone perfume and I use these minis to travel with. They also make such a great gift. 12.) Saint Laurent Canvas Wall Art – I’ve been looking for a cute sign for my office and this one screams fashion & style. It will fit in with my office decor perfectly. 13.) Ruffled Sleeve Tshirt Dress – Such a comfortable dress! I ordered a size small and love the fit. Perfect for this hot weather and would still look cute with some over the knee boots and a fun jacket. 14.) Cutout Choker Tee – I originally didn’t order this tee because it looked so low cut on the model. Then I started seeing other girls styling it and it was so cute on. I got it in two colors in a size small! I can honestly say that I was extremely happy with almost 95% of my Nordstrom purchases this year and I totally feel ready for all things fall! I also can’t wait to start styling some of my favorite looks on here for you as well. Enjoy the final days of the sale and have a great weekend! I got the same Zella leggings! I LOVE them. And the jogger pants too! My other favorite find was from MAC and it was a neutral set of lip glosses and lipsticks! I just ordered the burgundy suede Tory satchel🙈🙈🙈 I can't stop myself with this sale!! !